control the root device when Ubuntu is running on a Hyper-V host. the performance issues on the root device when hosted on Hyper-V.
should not control the disks. route, we can certainly help with the engineering work. Hi Brad - I am logging this bug on behalf of microsoft, I can't re-produce it myself as I only run Ubuntu and do not have a windows server 2008 with Hyper-V. I can ask them to provide a log but the bug is confirmed anyway. Which kernel version(s) are they looking for the fixes for this issue? 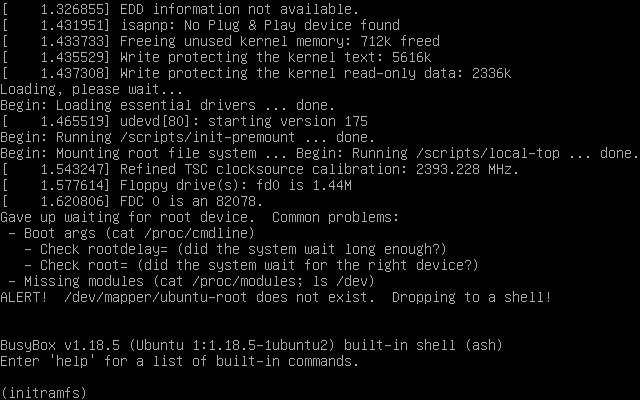 > Which kernel version(s) are they looking for the fixes for this issue? the upcoming 12.04 kernel, nothing before that. > drivers to the initramfs is probably the best way to go. Kernels should be synced shortly. Thanks. I've tested this, but it doesn't appear to work as expected. I installed today's precise-server ISO and then installed the new linux-image via dpkg -i. Checking /sys/block/sda/device/driver/0:0:0:0/vendor reported the driver as ATA instead of Msft as we would expect. Hmm, looks like the patch isn't quite right. I'll spin a replacement test kernel shortly. Ok I've updated the test kernels hopefully fixing the issue. If we could re-test the as before. Thanks. That didn't seem to work either - it was unable to mount the root filesystem. If there are steps that I can do within the shell to further diagnose, let me know. @Mike -- i suspect that that actually means it worked. But of course with the other bug, you don't have the drivers in your initramfs. I'll have to get an updated initramfs package for you as well. The intention here is to boot every disk volume using the virtual Hyper-V SCSI adapter? That would be different than the procedure for setting up VM guest disks (on Windows systems only?) as described in Microsoft's Hyper-V docs, but maybe that is the goal. > IDE devices. Hyper-V uses emulated devices with IDE controllers. You can have up to two IDE controllers with two disks on each controller. The startup disk (sometimes referred to as the boot disk) must be attached to one of the IDE devices. The startup disk can be either a virtual hard disk or a physical disk. Although a virtual machine must use an IDE device as the startup disk to start the guest operating system, you have many options to choose from when selecting the physical device that will provide the storage for the IDE device. For example, you can use any of the types of physical storage identified in the introduction section. > SCSI devices. Each virtual machine supports up to 256 SCSI disks (four SCSI controllers with each controller supporting up to 64 disks). SCSI controllers use a type of device developed specifically for use with virtual machines and use the virtual machine bus to communicate. The virtual machine bus must be available when the guest operating system is started. Therefore, virtual hard disks attached to SCSI controllers cannot be used as startup disks. >Although the I/O performance of physical SCSI and IDE devices can differ significantly, this is not true for the virtualized SCSI and IDE devices in Hyper-V. Hyper-V. IDE and SCSI devices both offer equally fast I/O performance when integration services are installed in the guest operating system. I can try this early 12.04 code out too on a Hyper-V host. I am using Ubuntu 10.04 as a guest OS quite a bit on Hyper-V hosts. @Tim -- I can't claim to have ever booted in this environment. The request to switch the boot disks over to the paravirtualised drivers was made as the performance over IDE is poor. It has been suggested by those in the know so I am assuming that it should work, though as I say I do not have access to anything to test myself. This doesn't change what the VM boots from - we still require that the system boot from an IDE disk. What this does enable is our hv_storvsc driver to control the root device, which uses hv_vmbus to communicate with dom0. hv_storvsc and hv_blkvsc were merged upstream a while back, and hv_storvsc is a generic block device that handles both IDE and SCSI traffic. @Mike -- I think we both mean the same thing, I just am looking at things from inside. Did the new kerenl and initramfs-tools combination work for you? Andy, what's the correct process to try both the kernel-image and the updated initramfs-tools? I installed the kernel-image, the initramfs-tools, and the initramfs-tools-bin package at once using dpkg -i, but I'm still getting the same hang as before. 3) can we try modprobing the required modules from the initramfs prompt (I think this is just hv_storvsc) and see if the drives are then detected (in dmesg) if so you could then try exiting from the shell which should retry the mount. @Mike -- if you are able to get onto freenode irc, then you might also like to come find me there, we might be able to diagnose this quicker there. We're missing hv_storvsc in the initrd. It's unclear if this is an issue with the hv_storvsc driver or something else, however. Though the issues seem to start where we start a scsi scan. After some internal investigation, this is a known issue in the build of hv_storvsc that is present in the Ubuntu kernel sources, including 3.2.0-16. The latest version of the driver, available in linux-next after Feb 14 (at its new location in /drivers/scsi/storvsc_drv.c) has that resolved, as well as other cleanup issues from the community review. In fact, I would strongly suggest that the latest hv* drivers from linux-next be used if at all possible. The snapshot being used as the base for the Precise kernel only has the hv_vmbus driver out of staging. With the release of the 3.3 kernel, the hv_netvsc and hv_mouse drivers were approved for exit, and we've already received word that the hv_storvsc driver will exit in 3.4. The quality of code after going through the community review is leaps and bounds better than what is present in 3.2, and should be ideal for a -LTS release. Please let me know how you'd like to proceed on this. We have pulled together a backport from that currnetly sitting in linux-next, roughtly what will hit 3.4, we have combined that with the fixes to the ata_piix driver identified above. @Mike could you test that for us in combination with the initramfs tools bits you already have. The kernel images are the newest ones in the same place as before (see above). Thanks. I've confirmed that the combination of linux-image (from above) and the initramfs-tools / initramfs-tools-bin from http://people.canonical.com/~apw/lp917135-precise/ result in a system booting and using hv_storvsc to handle the root device instead of ata_piix. * SAUCE: drm/i915: Enable RC6 by default on sandybridge. Ok this fix was incomplete as the CDROM/DVD are not supported via the hyper-v paravirt drivers. An updated fix is now applied. This bug is awaiting verification that the kernel for Precise in -proposed solves the problem (3.2.0-35.55). Please test the kernel and update this bug with the results. If the problem is solved, change the tag 'verification-needed-precise' to 'verification-done-precise'. After a IRC chat with Ben Howard, I'm tagging this as verified in Precise.